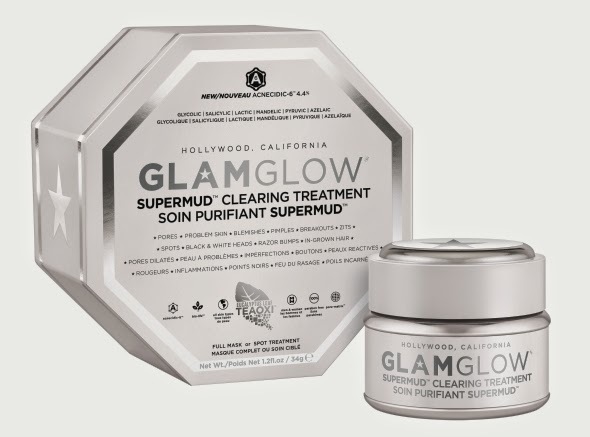 Another GlamGlow mask... the SuperMud contains Eucalyptus Leaf is best for those who has problem skin, open pores, blemishes, pimples, spots, black & white heads, razor bumps and in-grown hair. When your skin misbehaves it’s a problem - it’s for those your first impression and your first line of defense. SuperMud Clearing Treatment is to target those skin problems, prevent and heal from the inside out. You can use as a full mask or as a spot treatment as often as needed. It is suitable for men and women. SuperMud contains GlamGlow new Acnecidic-6 proprietary 6 acid AHA & BHA blend for mind-blowing fast results. BHA acids penetrate sebum oils unclogging pore congestion, which is the main cause of problem skin. AHA acids seep into the skin restoring photo damage, improving texture and helping reduce the appearance of hyper pigmentation. SuperMud contains Glycolic, Lactic, Salicylic, Mandelic, Azelaic and Pyruvic Acids. SuperMud also boasts Pore-Matrix our Activated-X Charcoal and K17-Clay that extracts 500-times it’s own mass in bacteria, sebum oils and toxins, revealing dots of Pore-Matrix™ before your eyes. Bio-Life-Cell-Science soothes skin using the complex natural occurring green life benefits. GlamGlow’s patent pending TEAOXI Technology delivers daily fresh natural eucalyptol, natural linalool and powerful flavonoids direct into the formula from the real pieces of Eucalyptus Leaf contained in the magical healing SuperMud. Ingredients: Aqua (Water), Kaolin, Magnesium Aluminum Silicate, Sodium Hydroxide, Eucalyptus Globulus Leaf, Mandelic Acid, Charcoal CI 77266, Parfum [Limonene, Linalool, Benzyl Benzoate], Glycolic Acid, Azelaic Acid, Lactic Acid, Pyruvic Acid, Salicylic Acid, Xanthan Gum, Aloe Barbadensis Leaf Juice, Maltodextrin, Iron Oxides CI 77491, Mentha Piperita Oil, Butylene Glycol, Glycyrrhiza Glabra Root Extract, Glycerin, Chamoilla Recutita Flower Extract, Calendula Officinalis Flower Extract, Cucumis Sativus Fruit Extract, Hendera Helix Extract, Symphytum Officinale Leaf Extract, Phenoxyethanol, Ethylhexylglycerin, Caprylyl Glycol, Hexylene Glycol, Methylchloroisothiazolinone, Methylisothiazolinone. Please take note that this is not a review, it is information sharing about the products.